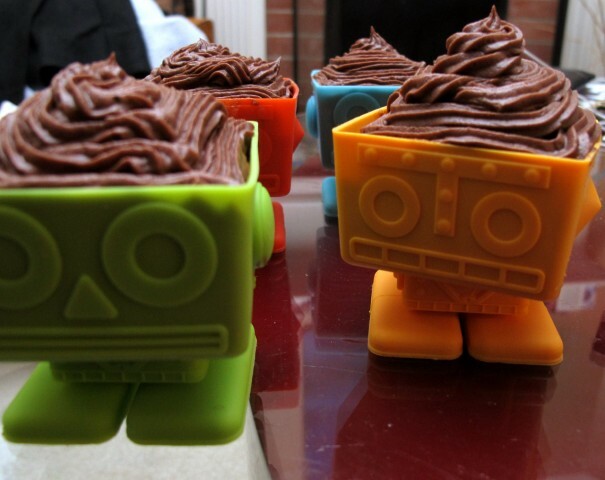 These are little silicone robots whose heads double as cupcake moulds. You pour the batter in, bake ’em, and end up with strange square cupcakes with robot faces imprinted on them. Or you can just frost the cupcakes while they’re still in the mould and end up with robots with what appear to be doo-wop band hairstyles. Fake edit: Apparently it was this recipe, except we didn’t have a vanilla bean, which is where the lemon zest came into play as a substitute. And this was the frosting recipe. This entry was posted in BakeSpite and tagged bakespite, cat, cupcakes. Bookmark the permalink. …is that a Destructoid cupcake on the right?